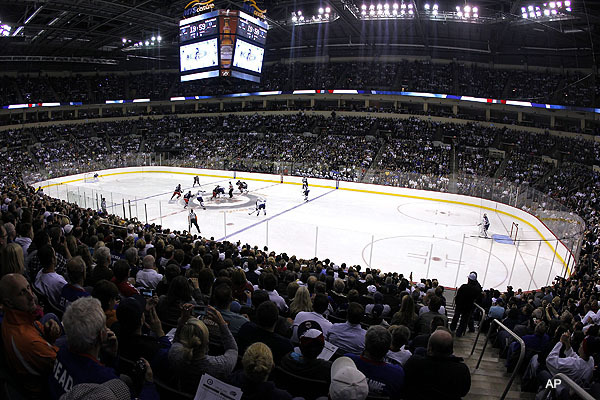 MTS Centre saw enough NHL action to last a lifetime, but more NHL hockey needs to follow. It's not your typical Benny & the Jets bit again. 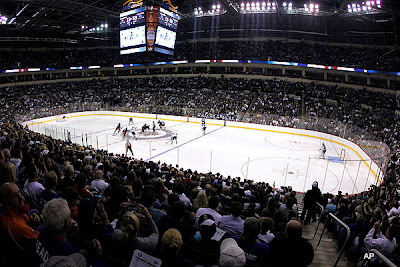 No, it's another squabble between the NHL and NHLPA that is getting hockey fans in Winnipeg nervous that they and their newly beloved team may go through their second lockout. Nothing is set in stone, but it looks like someone is starting to chip away at a piece of it with 19 days to go until the current CBA, which helped return NHL hockey to Winnipeg, expires on September 15th. But this time around, let's not get too worried Jets fans, a lockout would not bury our hockey team as it did last time around. 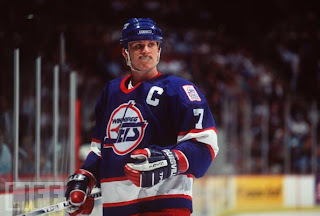 In 1994-95, the NHL lost half its season en route to playing an eventual 48 game schedule that saw the Jets finish with a dismal 16-25-7 record - a sixth place finish in the six team Central Division (three points out of a playoff spot, mind you). It wasn't the fact the Jets missed the playoffs in '94-'95 for the fourth time in their eventual last eight seasons in Winnipeg (which included no advances to the second round of the playoffs), it was the fact that the NHL was a different beast in the early-to-mid 1990's and a lockout at that point put the writing on the wall for the league's smallest market. In fact, the writing was so apparent on the wall, that the Jets were still a sub-.500 team when they left Winnipeg finishing 36-40-6 in their final season despite making the playoffs. Tkachuk & the Jets were doomed after the '94-'95 lockout. To top off the sundae-a-la-moving to Phoenix, they traded away key players, including fan favourite Teemu Selanne that season in order to save face and money. Oh, sorry for bringing up such painful memories, but at times I like to vent about the bitter, brutal, and still very real and happy past that was here in Winnipeg when Winnipeg Arena stood on Maroons Road instead of new office buildings. Fast forward now to today where Jets ownership is much more stable, much more willing to spend (when they feel necessary), and much more capable of keeping a team in the city through a lockout in the future. Unless the new CBA doesn't include a hard cap, the Jets may be in trouble right away, even a year back into the league. To be frank, the hard cap is the main ingredient in hockey working in Winnipeg. Without a hard cap in the NHL, the league will recycle its past from the mid-1990's to the last full season lockout of 2004-2005. In less words: the rich will be able to spend, the poor will try to keep pace. Sure, a luxury tax would aid smaller market teams, but in the end, it means little. The key word there is 'aid'. Tell me a team that likes to be 'aided' in order to win championships consistently and I'll show you a blank piece of paper because owners, GMs, and management will want to create their own winning tradition - not be helped by other richer teams. Take a look at baseball and how the luxury tax has affected the World Series champions of the last nine to ten years since it was instituted in 2003. The New York Yankees have consistently paid a luxury tax since 2003 and have consistently been a team above .500 since the new CBA in 1994 with twelve American League East division titles, four American League wildcard berths, seven American League pennants, and five World Series Championships. The Yankees, team's obvious richest team, have paid $206.1 million in luxury tax since 2009 and have won one World Series in that time. Since 1994, the Yankees have missed the playoffs only twice (1994, 2008) and have failed to advanced beyond the American League Divisional Series only seven of fourteen times. Their bitter rival Boston Red Sox have paid $18.8 million in luxury tax since 2009 and have been able to compete with the Yankees, winning two American League East division titles, seven American League wildcard berths, two American League pennants, and one World Series championship since the new CBA in 1994. Only two other teams have had to pay luxury tax - the Los Angeles Angels of Anaheim in 2004 and the Detroit Tigers in 2008 - both were under $2 million in tax. In 2012, the Yankees lead all teams in salary with a payroll of $197,962,289 - $142,717,589 more than the lowest payroll of the San Diego Padres. Does this sound like what NHL fans want happening to their league? Peering at MLB's 30 teams payrolls, the top 10 have been consistently in playoff contention - Yankees, Phillies, Red Sox, Angels, Tigers, Rangers, Cardinals, Giants - while the bottom 10-15 have been playoff contenders very sporadically and some not for 10 or more years - Padres, Astros, Royals, Pirates, Blue Jays, Rockies, Indians. There are success stories of the Tampa Bay Rays, who rank 25th in the team payrolls and are in the playoff hunt or of the Washington Nationals (20th) this season or the Oakland Athletics (29th) and Pittsburgh Pirates this season (26th) but how long do those ultimately last when players age and ask for larger contracts these teams cannot afford. It sounds an awful lot like the old NHL where the Detroit Red Wings, Dallas Stars, Colorado Avalanche, New Jersey Devils, and company ran the Stanley Cup pass-around with the checkbook and superstars while the Jets, Quebec Nordiques, Edmonton Oilers, Ottawa Senators, and other small market teams tried to stay alive and sometimes fail at it. Don't get me wrong, Mark Chipman will break the bank if another team goes after one of their own - i.e. if Paul Holmgren ever got the smart idea of sign Evander Kane to an offer sheet, it would not be a matter of days but a matter of hours (very few) in which the Jets would counter no matter the dollar amount. As the CBA negotiations continue their laborious and very inefficient process, there isn't that sense of urgency to get it done as I think Jets fans think we need. True North is a stable owner, capable of making revenue elsewhere besides the Jets hockey club. For Blake Wheeler's Jets, a hard cap is necesary. There is no reason to think that if the NHL is indeed about to lose another full season the Jets will be in trouble. If it happens for - God forbid - two seasons in a row, then start sounding the alarm. But as for now, Jets fans will not have to worry about anything unless the new CBA has a soft cap and luxury tax associated with it. If either the NHL or NHLPA is smart about their negotiating process, they will try to side in the favour of the small market teams being viable and a soft cap is not it. Though the NHLPA is presenting a plan that would have a revenue sharing system that the richer teams stream extra revenue to the smaller market teams in need of help, the soft cap counteracts that if it is implemented. And to the NHL's detriment in these discussions are the state of many of the southern market teams, including Florida, Dallas, and most importantly Phoenix. Gary Bettman and the NHL put those teams there thinking they were onto something but it turns out they were onto something for the short term and not for long term viability. If the NHLPA and PA president Donald Fehr are smart they will make any measures possible to make sure they can give it a good honest try to help these teams since the NHL has not done anything half as smart (by half I mean the half they got right being moving Atlanta). Whatever core economic issues are at stake here, one thing is for certain. The NHLPA needs to stand firm in some of its stances. The NHL has to get its house in order.